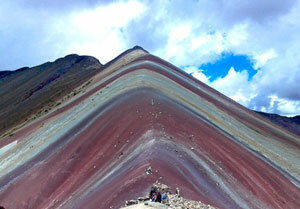 The Rainbow Mountain, or Cerro Colorado, is a stunning and unique formation of mountains in Cordillera Vilcanota. The highest being Ausangate, which stands at an impressive 6372m. Located south of Cusco, these impressive peaks surround glaciers, lakes and traditional Peruvian villages. These colourful mountains are guaranteed to be some of the most beautiful natural wonders you will see in Peru. 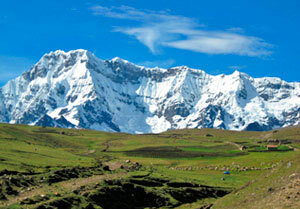 This one-day tour will take you off the beaten track and through several high passes of around 5000m. 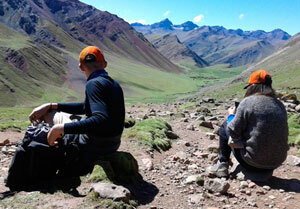 During this trek you will be surrounded by breathtaking and idyllic scenery, as well as heards of Alpacas and Llamas. Departure from Cusco is at 4am, where we will travel to Pitumarca. This journey will take around 3 hours. Travelling down remote roads alongside the Vilcanota river, we will pass through small canyons until we reach Quechunuño to stop for breakfast. Following breakfast we will begin a walk of around 8km to reach the highest point. During this picturesque hike you will see snowy peaks, beautiful mountains and packs of our indigenous animals. After 4 hours of walking, we will then reach the awe-inspiring Rainbow Mountain with panoramic views of the valleys. Here our guide will be able to answer any questions you may have. You will have the opportunity to take photos and relax before we begin our 3 hour descent. When we arrive back to Quechunuño, there will be time for lunch before we travel back to Cusco, arriving around 7pm. Two (2) liters of water.